Kampala is experiencing dark nights yet again. Some factories have ground to a halt. No twinkling lights, no TV, no music. There is an energy crisis and Kampalans are bothered. The rest of the country proceeds unbothered; for they have always had an energy crisis. 88 percent of Ugandans do not have access to electricity. Actually they have a survival crisis in which biting poverty denies them an adequate supply of basics such as food, water and medicine. This article, which comes in four parts, argues that the current approach to solving Uganda's energy problems is fundamentally flawed, not only in itself but also, and equally important, in the kind of economic development it will engender. Part I (the current section) of the article gives an overall introduction, and a definition of energy as well as a categorisation of the various energy sources. Part II explores the advantages in minimising energy needs and in using non-electricity energy sources. Part III is a critique of the prevalent centralised approach to electricity production. Subsequently, in Part IV, a decentralised model for electricity generation is proposed as an advantageous alternative for Uganda. Firstly, before a definition is given, the reader needs to note that energy is not an end itself but is a means to production of goods and services for the satisfaction of human needs. In the production unit, energy is combined together with raw-materials, labour and equipment to produce consumption items (like clothes, cars and furniture). Even when energy is directly "consumed" in the household, it serves the secondary role of running equipment such as TVs, cookers and washing machines. In both cases, energy is not consumed for its own sake but for what it can help deliver. A simple definition of energy is the amount of work that a physical system can do on another (this definition is taken from Wikipedia). For a clear understanding of the subsequent arguments, it is imperative to categorise the various sources of energy as a way of contextualisation. Figure 1: Various Sources of Energy. 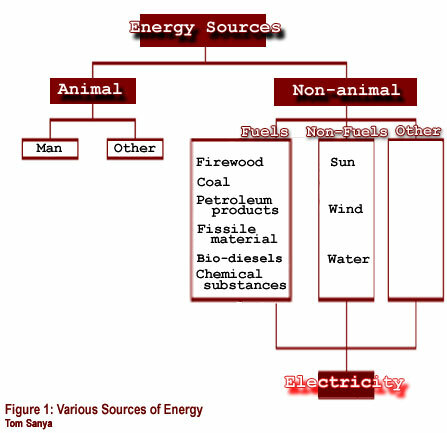 According to the figure above, two broad categories of energy sources are animal and non-animal sources. The animal sources comprise of man and other animals.�The ability of man to move (parts of) his body or move things about is a primeval energy source. Furthermore, man harnesses animals for their energy, e.g. to pull a cart or plough. We note here that electricity is: (a) just one of the many forms that energy can take (b) is the most refined source of energy - i.e. it is produced by processing what one would consider "primary" energy sources. In the current discussions of the energy crisis in Uganda, the main debate seems to revolve around how to produce electricity. With the foregoing discussions as a background, this article aims to broaden the debate by using arguments in a four-level framework: (1) eliminating the need for energy (2) greater utilisation of animal energy (3) direct utilisation of energy that is simultaneously non-animal and non-fuel (4) decentralised production instead of centralised generation of electricity. In the next section (Part II), it will be argued that elimination of the need for energy ought to be a crucial component of any national energy strategy. Also, the advantages of using non-electricity types of energy will be discussed in the same section.